Storyline: The heroin of this book, a girl about seven years old, lives in a big city. There, people are very busy and everything is monochromatic, shades of brown perhaps (or rather gray which, as right now, I find it highly inappropriate to speak of, thanks to that writer, you know who). The only bright spots are her toys, a scooter, a kite, a pencil, all red. Her day looks boring and totally unappealing. Several kids on the street are playing ignoring her, her mother is busy on the kitchen speaking on the phone (with her friends? ), her dad is almost swallowed by a computer screen, and her sister is engulfed in book on the couch. Even the fat cat is napping away on the floor. The girl doesn’t know what to do, she is looking around her room, picking up the red pencil and starting to draw a red door on the wall. And like magic, the door opens. The girl steps on the other side, straight into a different world, a colorful one, the beginning of the journey. And from now on she sets up on a big adventure with an unpredictable end. Step after step, and drawing after drawing, she passes through enchanted worlds where she encounters a magical forest, a city on water and a space ship on the sky. She makes her way through unusual places filled with wonder and when she gets caught in dangerous situations she draws her way out of it: a red boat to cross the river, a balloon to fly in the sky, a red carpet to fly back to the ground. And it looks like she had a mission, to free a purple bird, caged and guarded up in the sky. At the end of her journey, a little purple door on a palm tree takes her back to the city. And, as she steps through it with the bird on her shoulder, a boy with a purple crayon is there to meet her. From now on, the girl is not alone anymore. Now, she has a friend to play and to draw wonderful stories from their imagination, riding a bike with red and purple wheels. Last, but not list I should mention that this book has no words, only pictures. Illustration: Aaron Becker is also the illustrator of this book. He does of very fine job telling the above story using only pictures. His detailed drawings remind me of the books of David Wiesner; the same charmed worlds where kids can create their own imaginative adventure. 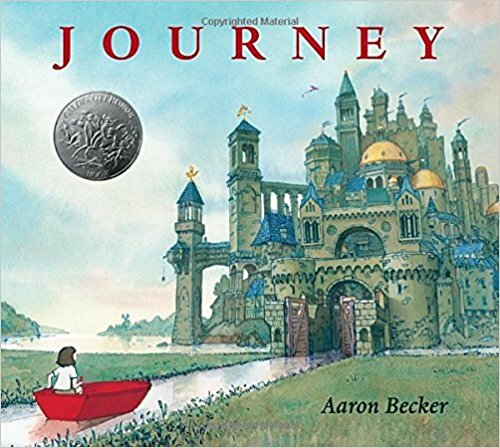 Becker’s world is fairy-tale like, his castles and buildings and ships in the sky are laced with miniature decoration, very well detailed. By illustrating one object with a strong color, he draws attention to the most important thing in the page. But he is not wasting the paper: his 40 pages of pictures tells a thousand words story.